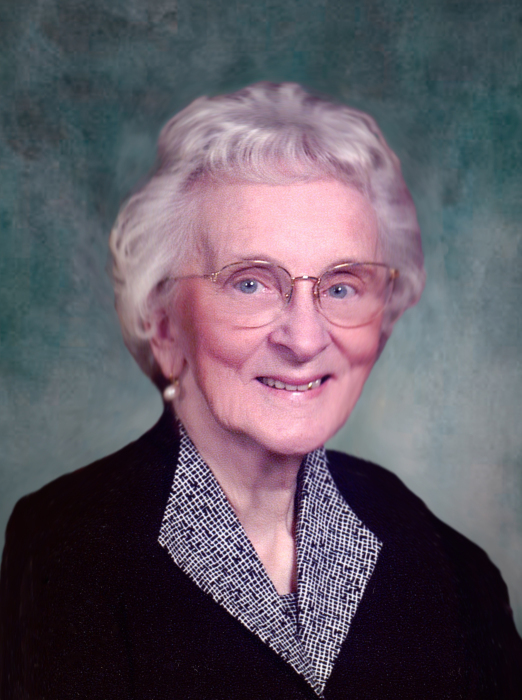 Memorial services for Audrey Erickson of Chokio, MN will be Monday, December 10, 2018 at 11:00 a.m. at Our Savior's Lutheran Church in Chokio, with Minister Minette Stalheim Johnson officiating. Visitation will be Sunday from 2 to 4 p.m. at the Pedersen Funeral Home in Morris and for one hour prior to services at the church on Monday. Burial will be in Reque Cemetery, rural Alberta. Audrey Erickson, 85, passed away in her Chokio home on Wednesday, December 5. Audrey was born on February 19, 1933, in Morris, MN to Carroll and Laura (Brunkow) Johnson. She grew up in Chokio and graduated from Chokio High School. Following high school, she started her employment at the bank in Chokio, working her way from teller to bank officer, until she retired. Audrey married Jim Erickson on February 4, 1956, beginning their married life in a small house in Chokio. Approximately two years later they purchased their farm south of Chokio, living there until Jim's retirement from farming, when they moved back into Chokio. A lifelong resident of Chokio, Audrey was the town's biggest cheerleader, and the community held a special place in her heart. She served on the boards of Chokio Research and Development and Chokio Housing, and was active in the Chokio Community Club. As 'Asking Audrey' she loved raising money for the annual Community Picnic. She had a servant's heart in her participation in many areas at Our Savior's Lutheran. Audrey also served on the Board of Directors at United Farmer's and Merchant's State Bank and in several offices of the Chokio Study Club, an organization dear to her heart. She was church organist beginning in high school until her children were born, and played for countless weddings as well. In her retirement years, Sunday evenings were spent collecting news for the Chokio Review. As much as she loved her community, Audrey's love for her family was boundless, and she was happiest when following the lives and activities of her children and in recent years, her grandsons. She loved any musical events they may be in, but more often was cheering and keeping score at their many baseball and football games starting in grade school, continuing into college, and in recent years, took it upon herself to become the announcer for the Chokio Coyotes town baseball team. She was thrilled to welcome two great-granddaughters into the family this past year. Audrey is survived by her husband, Jim of Chokio; daughter Janet (Mick) Rostad of Fargo ND; son Dean (Jeri) Erickson, Chokio; grandsons Chris (Nikki) Rostad, Fargo; Jordan Rostad, Fargo; Alex (Nicole) Erickson, Johnson MN; and Chandler (Beth) Erickson, Chokio MN; and great granddaughters Reese Rostad and Hallie Erickson. Also surviving are her brothers, Gay (Phyllis) Johnson and Roy (RoseAnn) Johnson of Browns Valley, MN and sister, Judy (John) Carlsted, of St. Cloud MN, and brother-in-law and sister-in-law, Maynard and Arline Erickson, Chokio, and several special nieces and nephews. She was preceded in death by her parents. Pedersen Funeral Home is in charge of the arrangements.